Name Variation John Conrad Weiser Jr. was also known as Johnathan. John Conrad Weiser Jr. married Mary Elizabeth Wilson. John Conrad Weiser Jr. was born on 15 December 1762 at Pennsylvania. He was the son of John Conrad Weiser and Maria Margaret Batdorf. John Conrad Weiser Jr. died in 1842 at Pennsylvania. Mary Elizabeth Wilson married John Conrad Weiser Jr., son of John Conrad Weiser and Maria Margaret Batdorf. Child of Mary Elizabeth Wilson and John Conrad Weiser Jr.
Name Variation Martin Weiser was also known as Martinus. Martin Weiser married Maria Catherine (?). Martin Weiser was born on 15 October 1751 at Philadelphia, Pennsylvania. 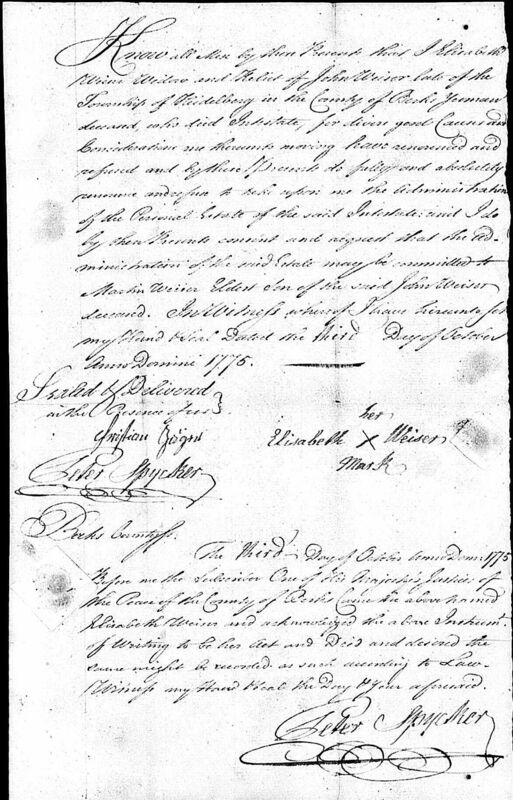 Martin Weiser was the executor of John Conrad Weiser's estate on 3 October 1775 at Berks, Pennsylvania; Probate record for John Weiser by his wife Elizabeth Weiser asking for eldest son Martin to be executor. Martin Weiser died on 3 November 1822 at age 71. Service Description: 1) GUARDING PRISONERS. Name Variation Samuel Weiser was also known as Simon. Samuel Weiser was born on 16 May 1765 at Pennsylvania. Samuel Weiser died on 15 January 1856 at age 90. Samuel Weiser was the 9th of 11 children born to John Conrad Weiser b. 19 Sep 1725, son of Christopher Frederick and Elizabeth ( ) Weiser. JCW married (first) Maria Margaret Battorf (10 Oct 1729- 22 Dec 1772) and married (second) on 3 Feb 1774 to Elizabeth Preiss (no dates). JCW was a Lutheran and a farmer in Tulpehocken Twp., Berks Co. Pa.. JCW d. Sep 1775. Son Samuel was b. to JCW's first wife on 16 May 1765 near Womelsdorf (Berks) Pa. He m. Eva Catharine Pfluger (28 Jul 1762- 5 Jan 1856 York, Pa.). Samuel d. 20 Jul 1856. Samuel and Catharine Weiser's firstborn was Samuel Weiser b. 3 May 1788 York, Pa. d. 20 Jul 1856. Married (first) Anna Maria Ilgenfritz (18 May 1808- 23 Jan 1876 York, Pa.). They had ten additional children through 1848. Married Name 3 February 1774 As of 3 February 1774,her married name was Weiser. Elizabeth Preiss married John Conrad Weiser, son of Christopher Frederick Weiser and Catherine Elizabeth Roeder, on 3 February 1774. 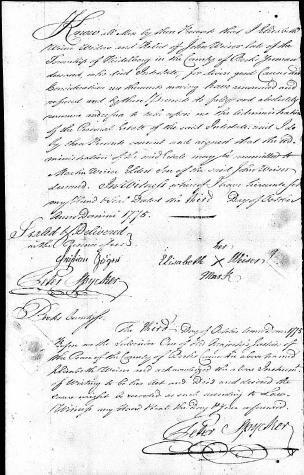 Her estate was probated on 3 October 1775 at Berks, Pennsylvania, Probate record for John Weiser by his wife Elizabeth Weiser asking for eldest son Martin to be executor. Name Variation Hanna Johannas Uebele was also known as Hans. Hanna Johannas Uebele married Anna Catherine (?). Hanna Johannas Uebele was born in 1640. Married Name Her married name was Uebele. Anna Catherine (?) married Hanna Johannas Uebele. Anna Catherine (?) was born in 1644. Married Name 1711 As of 1711,her married name was Weiser. Anna Margaret Miller married John Conrad Weiser, son of Jacob II Weiser and Anna Tretz, in 1711. Married Name 19 May 1705 As of 19 May 1705,her married name was Boss. Maria Catharina Weiser was born in 1686. She was the daughter of John Conrad Weiser and Anna Magdalena Uebele. Maria Catharina Weiser married Hans Conrad Boss, son of Jerg Zacharias Boss, on 19 May 1705. Maria Catharina Weiser died on 26 February 1761. Hans Conrad Boss was the son of Jerg Zacharias Boss. Hans Conrad Boss married Maria Catharina Weiser, daughter of John Conrad Weiser and Anna Magdalena Uebele, on 19 May 1705. Anna Margarete Weiser was never married. She was born in 1689. Anna Margarete Weiser died in September 1748 at New Jersey. Anna Margarete Weiser immigrated with John Conrad Weiser on 13 June 1710 at London to, New York, New York; left for America June 24, 1709; John Conrad sold his property to his already-married eldest daughter and took the surviving eight children to London, from which they embarked several months later. The ships floated around in various English harbors from December 1709 until April 1710, when 3 warships and Robert Hunter, NY governor, joined the group and began the crossing. Conditions were dreadful and many died. Their vessel, the Lyon, landed at New York on June 13, 1710, with nine other vessels full with 800 other families, who had fled down the Rhine valley to Rotterdam, and then across to London to escape the ravages and persecutions of Louis XIV, the Catholic, had let loose on Protestant Germany after the Revocation of the Edict of Nantes in 1685. The poor of London had come to resent them deeply, and that's why many of the immigrants were rushed off to New York to serve as a buffer against the French, a Protestant buffer, and as suppliers of naval stores. There, about 2400 souls of the original 4000 who started the trip made it to quarantine on Governor's Island in Manhattan. About 250 more people died there, and were buried on Governor's Island. The English insisted that older children be indentured to settled residents, so John Conrad's two children George Frederick and Christopher Frederick were bound out by the governor to Long Island. The remaining Palatine immigrants were bound to produce tar from the pitch of pine trees at camps near the Hudson River, about 100 miles north of New York City. Eventually, there came to be the East Camps (really four small villages of Annesbury, Queensbury, Haysbury and Hunterstown, with a joint population of 1189), and the West Camps (614 people in 3 villages). It is doubtful if there are that many people there today, according to Elaine B Liepshutz, in The Palatine Camps of 1710! The settlers were divided into five villages at first, and John Conrad was the head of Queensbury. As such, he voiced the complaints of his fellowmen before Governor Robert Hunter, who was caught in an impossible situation: the trees could produce no tar, the overseer of the Palatines (Robert Livingston) was a scoundrel, and the Germans expected better conditions-- plenty of food (all provisions were issued from Manor warehouses) and land of their own. Even children walked the three miles to the pine forests to work, picking up fallen knots from trees. Anna Magdalena Weiser was born in 1692. Anna Magdalena Weiser immigrated with John Conrad Weiser on 13 June 1710 at London to, New York, New York; left for America June 24, 1709; John Conrad sold his property to his already-married eldest daughter and took the surviving eight children to London, from which they embarked several months later. The ships floated around in various English harbors from December 1709 until April 1710, when 3 warships and Robert Hunter, NY governor, joined the group and began the crossing. Conditions were dreadful and many died. Their vessel, the Lyon, landed at New York on June 13, 1710, with nine other vessels full with 800 other families, who had fled down the Rhine valley to Rotterdam, and then across to London to escape the ravages and persecutions of Louis XIV, the Catholic, had let loose on Protestant Germany after the Revocation of the Edict of Nantes in 1685. The poor of London had come to resent them deeply, and that's why many of the immigrants were rushed off to New York to serve as a buffer against the French, a Protestant buffer, and as suppliers of naval stores. Maria Sabina Weiser was born in 1694. Maria Sabina Weiser immigrated with John Conrad Weiser on 13 June 1710 at London to, New York, New York; left for America June 24, 1709; John Conrad sold his property to his already-married eldest daughter and took the surviving eight children to London, from which they embarked several months later. The ships floated around in various English harbors from December 1709 until April 1710, when 3 warships and Robert Hunter, NY governor, joined the group and began the crossing. Conditions were dreadful and many died. Their vessel, the Lyon, landed at New York on June 13, 1710, with nine other vessels full with 800 other families, who had fled down the Rhine valley to Rotterdam, and then across to London to escape the ravages and persecutions of Louis XIV, the Catholic, had let loose on Protestant Germany after the Revocation of the Edict of Nantes in 1685. The poor of London had come to resent them deeply, and that's why many of the immigrants were rushed off to New York to serve as a buffer against the French, a Protestant buffer, and as suppliers of naval stores. George Frederick Weiser was born in 1697. George Frederick Weiser immigrated with John Conrad Weiser on 13 June 1710 at London to, New York, New York; left for America June 24, 1709; John Conrad sold his property to his already-married eldest daughter and took the surviving eight children to London, from which they embarked several months later. The ships floated around in various English harbors from December 1709 until April 1710, when 3 warships and Robert Hunter, NY governor, joined the group and began the crossing. Conditions were dreadful and many died. Their vessel, the Lyon, landed at New York on June 13, 1710, with nine other vessels full with 800 other families, who had fled down the Rhine valley to Rotterdam, and then across to London to escape the ravages and persecutions of Louis XIV, the Catholic, had let loose on Protestant Germany after the Revocation of the Edict of Nantes in 1685. The poor of London had come to resent them deeply, and that's why many of the immigrants were rushed off to New York to serve as a buffer against the French, a Protestant buffer, and as suppliers of naval stores. Married Name 1722 As of 1722,her married name was Pickert. Married Name 1722 As of 1722,her married name was Pickard. Anna Barbara Weiser was born on 17 October 1700. Anna Barbara Weiser married Nicholas Pickert in 1722 at New York. Anna Barbara Weiser immigrated with John Conrad Weiser on 13 June 1710 at London to, New York, New York; left for America June 24, 1709; John Conrad sold his property to his already-married eldest daughter and took the surviving eight children to London, from which they embarked several months later. The ships floated around in various English harbors from December 1709 until April 1710, when 3 warships and Robert Hunter, NY governor, joined the group and began the crossing. Conditions were dreadful and many died. Their vessel, the Lyon, landed at New York on June 13, 1710, with nine other vessels full with 800 other families, who had fled down the Rhine valley to Rotterdam, and then across to London to escape the ravages and persecutions of Louis XIV, the Catholic, had let loose on Protestant Germany after the Revocation of the Edict of Nantes in 1685. The poor of London had come to resent them deeply, and that's why many of the immigrants were rushed off to New York to serve as a buffer against the French, a Protestant buffer, and as suppliers of naval stores. Name Variation Nicholas Pickert was also known as Pickard. Nicholas Pickert married Anna Barbara Weiser, daughter of John Conrad Weiser and Anna Magdalena Uebele, in 1722 at New York. John Frederick Weiser was born on 25 June 1702. John Frederick Weiser died on 2 July 1702. Rebecca Weiser was born on 6 June 1703. Rebecca Weiser died on 8 June 1704 at age 1. John Frederick Weiser was born on 27 February 1705. John Frederick Weiser died in December 1710 at age 5. John Frederick Weiser immigrated with John Conrad Weiser on 13 June 1710 at London to, New York, New York; left for America June 24, 1709; John Conrad sold his property to his already-married eldest daughter and took the surviving eight children to London, from which they embarked several months later. The ships floated around in various English harbors from December 1709 until April 1710, when 3 warships and Robert Hunter, NY governor, joined the group and began the crossing. Conditions were dreadful and many died. Their vessel, the Lyon, landed at New York on June 13, 1710, with nine other vessels full with 800 other families, who had fled down the Rhine valley to Rotterdam, and then across to London to escape the ravages and persecutions of Louis XIV, the Catholic, had let loose on Protestant Germany after the Revocation of the Edict of Nantes in 1685. The poor of London had come to resent them deeply, and that's why many of the immigrants were rushed off to New York to serve as a buffer against the French, a Protestant buffer, and as suppliers of naval stores. Erhard Frederick Weiser was born on 11 June 1706. Erhard Frederick Weiser died on 29 November 1707 at age 1. Rebecca Weiser was born on 11 June 1706. Rebecca Weiser died in 1709. Jacob Weiser was the son of John Conrad Weiser and Anna Magdalena Uebele. Married Name Her married name was Klein. Rebecca Weiser was the daughter of John Conrad Weiser and Anna Magdalena Uebele. Name Variation John Frederick Weiser was also known as Johann Frederich. John Frederick Weiser was born on 14 November 1713. He was the son of John Conrad Weiser and Anna Margaret Miller. Phillip Weiser was born on 7 September 1722 oldest son of Conrad Weiser. Phillip Weiser married Sophia Riem on 22 November 1748. Phillip Weiser died on 27 March 1761 at age 38 age 38 years. Frederick Weiser was born on 24 December 1728. Frederick Weiser married Ameila Zoeller on 3 December 1751. Frederick Weiser died in 1790. Peter Weiser was born on 27 February 1730. Samuel Weiser was born on 23 April 1735. Benjamin Weiser was born on 18 July 1736. Benjamin Weiser died in October 1736 at at 3 months.